Do airport scanners pose risks? Just how safe are airport scanners? Have airport scanner risks been well studied? 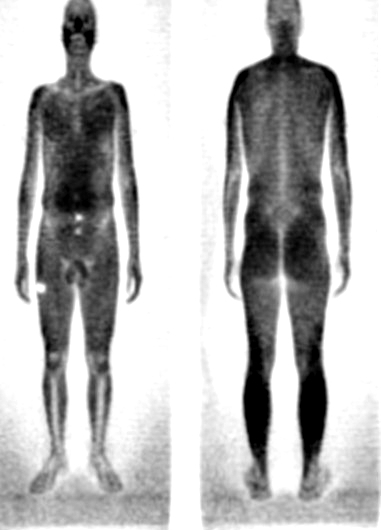 There are two main types of airport scanners used in whole body imaging of passengers. One type is the millimeter-wave scanner like ProVision. These scanners probably pose less of concern because they do not use x-rays but as stated in a recent analysis by radiation expert Dr. John Moulder: "information on the millimeter-wave scanner is very difficult to find". Millimeter wave scanners use radio-waves similar to a microwave. On the other hand, there are definite risks with the other scanners which are called x-ray backscatter scanners. The amount of radiation delivered during a backscatter airport scan is estimated to be very low: about 1 microsievert. A Sievert is a measure of energy from radiation. The huge federal bureaucracy called the Transportation Safety Administration (TSA) claims that the amount of radiation a person is exposed to during x-ray scanning is less than what one would get from background radiation during less than 10 minutes of flight in the airplane. As Dr. Moulder states, "this assumes that the machines cannot malfunction or be misused in ways that substantially increase the power density". That concern holds for both types of scanners. And there remain many other possible risks from airport scanners that use x-ray backscatter. First is the fact that there are no long-term studies of repeated exposure to these doses of radiation. The radiation in these backscatter scanners is said to concentrate in the superficial tissues like skin. But as stated in a recent paper “there is no accepted mathematical model for understanding the relationship between skin exposure and risk of skin cancers”. In addition despite the presumed concentration in skin, there is some penetration of the x-rays through the body. That’s why bones are seen on many images like in the one below. All x-ray devices must be properly maintained and serviced. Even if the scanners are 99.9 % reliable, there would still be many people put at risk if hundreds of millions of scans are performed with 0.1 % failure. And with equipment malfunction people might be overexposed to the x-rays. At this time there are about 800 million commercial passengers getting on planes each year in the U.S.
Dr. David Brenner points out the risk to the population as opposed to the individual. Let’s say, the individual risk of causing cancer from x-ray backscatter scanners is one in 10 million. When almost 1 billion people in the U.S. each year are exposed to this technology, some cancers are very likely to occur just because of so many people being exposed. That reality has led the European Union to ban scanners that use x-rays. Dr. Kaufman and others believe this use of x-ray backscatter scanners is a “mass experiment … the results of which will not be known” for years. A general medical principle is first, do no harm. And when it comes to x-rays, the comparable principle is to use as low as reasonably achievable (ALARA) exposure. And Dr. Moulder writes, there has been no independent review or regulation of these scanners and although "all other x-ray systems in the U.S. are regulated and inspected by state radiation protection agencies. The TSA has somehow exempted themselves from such oversight and appears to be ignoring widely-accepted radiation safety practices". Millimeter-wave scanners do not use ionized radiation like the x-ray backscatter scanners. But the risks of millimeter-wave scanners remain unclear. Aside from safety, there is no evidence that scanning of passengers prevents terrorist acts. In fact, there are ways of avoiding detection of weapons on the scanners. Israeli airport security has not implemented this scanning technology, pointing out its deficiencies. Take a look at this excellent presentation. And you may find this very interesting. Despite airport scanner risks and failings, there have been monetary forces that played a role in forcing this technology upon the public. Former head of the U.S. Department of Homeland Security Michael Chertoff is one who has clearly profited. And despite promises to conduct more studies, the TSA has failed to do so. That's my analysis of airport scanner risks. As long as I can, I will choose to “opt out” and not be imaged.